Update 14.07.2015: We are currently thinking about producing an Arduino KNX shield. Please let us know if you are interested. Thanks! After having heard about it a couple of times already, I recently rediscovered the Arduino for myself and quickly came up with an idea for a first project – connecting it to KNX (formerly known as EIB). This was actually quite easy and I’d like to share my experience (and code) here in case somebody wants to do a similar thing. To interface with KNX an interface IC is required (at least if you’re not able to build one on your own). I used a Siemens TP-UART for the job (obtained from Opternus Components). The TP-UART converts the signal from KNX to a UART signal (compatible with Arduino’s serial ports) and cares for a lot of the low-level details, e.g. line access control and telegram repetition. The serial protocol is described in depth in the TP-UART datasheet. I built it up on a breadboard for now using an Arduino Mega 2560. Using the Mega is the simplest solution as it has multiple UARTs so that you can connect the usual USB for programming and the TP-UART at the same time. This makes debugging using the serial “console” easy. Next, I needed some software. After fiddling around with the Arduino IDE for a short time, I noticed it’s pretty limited (at least if you’re used to full-fledged environments like Eclipse). So I quickly started building a library in Eclipse. The library has a comparably simple interface to the user such that he/she doesn’t have to care about the details of the KNX / TP-UART protocol. While implementing the library I needed some time to figure out the details of the protocol (e.g. when I need to send the ACK / NACK confirmation on an incoming telegram). Overall however it was not too difficult. The whole source code of the library can be found on my Bitbucket repository for this project. There are also some examples in there that show the use of the library. The first “real” example is the use of a Dallas temperature sensor and sending its values to KNX in regular intervals and also answering to read requests on a certain group address – in the repository the “TemperatureReadoutOneWire” example. Feel free to use the library for anything you want (of course without any warranty). If you have any improvements, suggestions or found a bug please let me know e.g. by using the issue tracker. Dieser Beitrag wurde unter Arduino, KNX abgelegt am Montag, 23. Januar 2012 von dka. another question, is why all knx tpuart use optoisolator, why do we need them ? isn’t it easier to directly connect the rx/tx to the arduino ? this was basically out of interest and price concerns. The eval board seems to be great stuff though! The Optocouplers are just a safety measure. While the Arduino is powered from the USB port of my PC I wanted to make absolutely sure that it is never hit by any voltage originated in the KNX bus. Once you’re running the Arduino of KNX (which is easily possible with the TP-UART) you can safely remove them. you can have a look at the Bitbucket repository. There’s already a PCB layout in there. I’m currently getting a few of them produced for my own use. I’ll report if everything works well such that anyone could safely have them produced for themselves. Note that I don’t plan to sell any of these at any time. Is it possible to use the target address so if you push a button with target address 0/0/1 that the arduino know that his pin 5 is that address for example? I cant get the int of the Main,Middle,Sub into a variable that i can use in arduino. Sure, just determine which pin to switch depending on the received address. In the „ReceiveKNXTelegrams“ example everything is prepared for this. First you set on the TPUart objects which group addresses shall be listened on. Then, just use the appropriate methods on the KNXTelegram to determine the addressed object. Note that the address you need to pass to the constructure of KnxTpUart is the physical address to use. Each device on KNX only has one such address which is also mainly used for programming and as sender address in the telegrams. Normal communication is always done through group addresses. It can be confusing as both addresses look very similar. Are you working in this project? What it is the actual situation? I´m working in a KNX network with a WAGO 750-849 and CoDeSys, but I want try this. I already ordered a arduino. I´ll let you know as soon as I get it. yes, some friends and myself are still working on this project. In fact we are trying to design a full room controller based on an ATXMega processor (using the great XMegaDuino environment). However, we will only publish the source once it has reached a certain level of stability which might take us another 6 months or so. Updates to the Arduino KNX library are in the repository as soon as we do them, though. 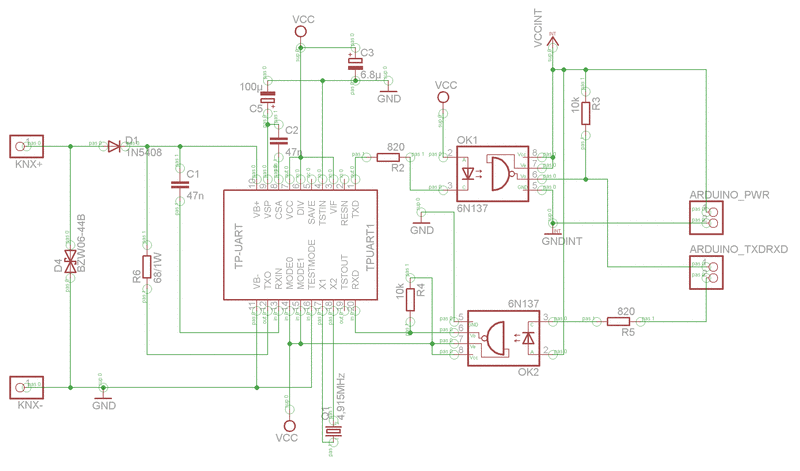 While ago, in this post you mentioned design works related to Room controller. What is the status of this project? Are you willing to publish results? I would like to ask if you use Raspberry Pi? I would like to find out more on how Raspberry Pi can work with Arduino to function as a simple yet useful home automation 🙂 Also, i’m not too sure which Arduino i should choose as there are a lot of them out there. I ordered an Arduino Uno though. I have a Raspberry Pi as well but am not using it for KNX at the moment (also not planning to do so). If you like to have an easy-to-use ready-made module I suggest looking at the BAOS modules of Weinzierl Engineering, see http://weinzierl.de/de/development/820.html – we have also used one of these modules in the past and they work great. On the other hand, you can use the Raspberry Pi to connect to your KNX/IP gateway via Ethernet, which would save you from any additional Hardware costs. great lib! Thanks for sharing. I currently do not have plans to include KnxNet/IP. However, there are KNX-IP-Routers that can convert from/to KNX and can also be used for programming the KNX devices via IP. Yes, you understand correctly – these are currently the only two functions. Adding DPT types would make sense and also an abstraction such that you have some kind of „datapoint objects“ to interact with. i’m trying to develop a similar project based on pic microprocessors. i have just tryed to buy the TPUART device from „opternus component“ but the answer was that they can’t deliver/sell to a private hobbyst. do you have some suggestion for it? unfortunately this is the downside of the TPUART. However there might be resellers that sell it to private persons without problems. In fact if you have a company it’s not a problem to also order very small quantities (1-2). Did you ever try to use Serial0 for communication with the TPUART? 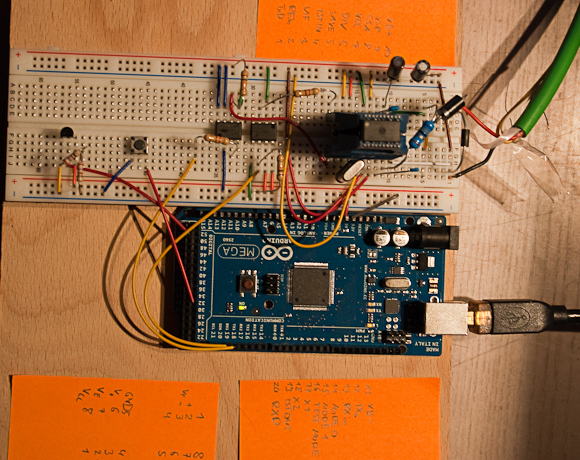 We have tried this but it was not possible to establish a communication between TPUART and the Arduino Mega. If we use Serial1, Serial2, … it works great. Maybe you have an answer for this? Can this be caused by the USB To RS232 converter connected to the Serial0 port. The reason why we have tried Serial0 is to use this also on an UNO which only has Serial0. It would be great if you could give us a short answer! this should actually work without any problems, however note that you need to disable all DEBUG output and also – probably – disconnect the USB will communicating through this port. I have disabled all the debug messages and I also have the USB connection removed to be sure that there is no influence on serial interface via the USB interface. But there is still no communication possible. With the serial interface 1,2 and 3 it works without problems. I still think that the USB to serial converter will cause the problem in this situation. Maybe anyone has found a solution for this. It would be fine to get an answer on this. Background: We are currently using your code with a TPUART 2.0 evaluation board connected to Arduino Mega 2560 and a existing up and running KNX system. Also, we are facing trouble establishing a physical address for the evaluation board. When we upload the program to the Arduino, and tried to check the physical address on the ETS 4.0. We are unable to find the physical address 15.15.20. What are the potential steps to solve the above question? 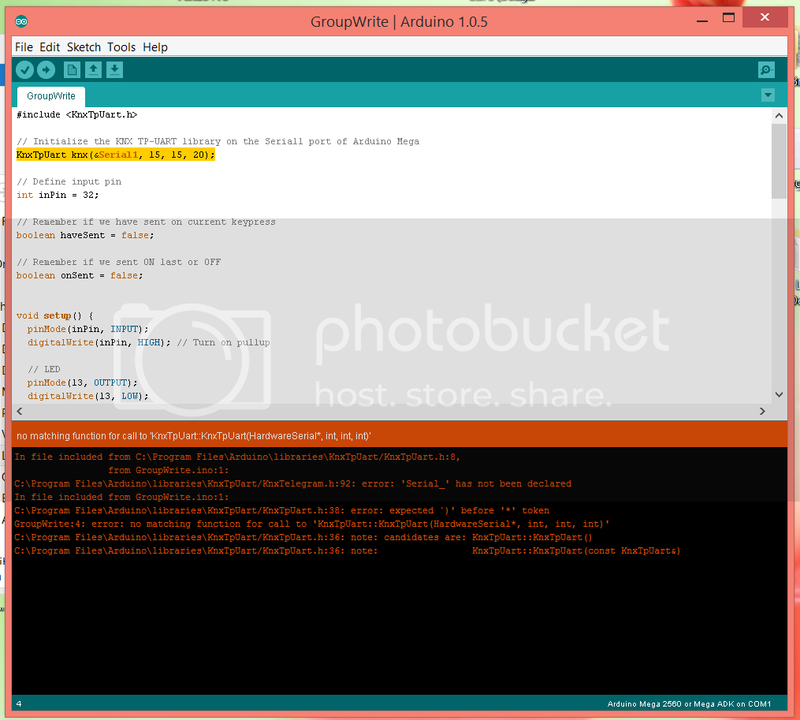 the most easy thing to test is actually to let the Arduino send out any telegram (e.g. a group write boolean). Put this in a loop to send it out e.g. every 2 seconds or so. Then, use the ETS bus monitor and you should see the telegrams. I have never used ETS 4, so I can’t tell how it would look there, but I guess this procedure should also work here just to see if the Arduino is connected to KNX correctly. As you can see i use a delay(10);, else no right read request is received, maybe you know why? Is this also the problem that if i do 50 reads in a very short time, i miss 2 or 3 read requests? it’s possible that you miss the requests because of the delay (the serial buffer is limited in Arduino and the serialEvent() function is only called once per loop). It might also be influenced by whatever you do in your loop()-function. It’s also strange that you need the delay for receiving the request correctly. This should not be neccesarry. Thanks for your answer and its solved now. In the lib are some hardcoded Serial usages. And i use Serial to connect the KNX tpuart. I added it all after a debug parameter and now it works without delay and i receive all commands. I was thinking to make a KNX server with an android unit (JXD MiniPad 36USD on aliexpress.com). I downloaded the BAOS democlient since i was planning to do some testing with their BAOS card. In the DEMO software you can switch from RS232 to IP/UDP and IP/TCP suggesting the port 120004 (TCP/IP). Has anyone here made a TCP/IP or IP/UDP server for KNX? Does it use the same protocol as twisted wire? AFAIK the protocol is basically the same, but of course headers are different. Maybe you want to have a look at the Calimero project (http://sourceforge.net/p/calimero/wiki/Home/) – they have a Java lib for KNX communication. I only tried it once and found it working well. I was wondering if the tpuart could be used with BatiBUS? I have Siemens Albatross and that uses BatiBUS to communicate. I’d like to log mainly temperatures but also other measuremets and statuses from there. finally i have developed a similar project based on pic microprocessor PIC18F26K80. Second project is an effective interface between a domotic network Vimar and a self-builded CAN network. Now from my web server connected on CAN net i can interact with the official domotic system. this second project differ from first only for different firmware, same hardware. is it possible to connect the TPUART 2.0 evaluation board with a arduino uno ? this should be possible, but I’m not sure if you can use my TPUART code for it (as it was written for the version 1). I downloaded the source code and placed the KnxTpUart forlder in C:\Program Files\Arduino\libraries\. When I compile the Examples\GroupWrite skect i get the following error. Am I missing something ? i use internal comparator of PIC and relative interrupts for decode KNX signals. galvanic isolation is not my objective for now, i will add later. Very usefull page thank you! Do you think it is possible to get the knx-tp wireless with a xbee module? So that you have multiple setup’s(arduino/tpuart/xbee) as nodes to make some kind of mesh network? This is excellent – I was planning on doing something very similar myself, so to find most of it here is great. I’ve been having some difficulty in sourcing the tpuart parts – Opternus seem fine if you’re a company, but seem a bit difficult if you’re not, so I was thinking that there has to be a market to sell these shields (or even make an Arduino + TPUart board that comfortably fits in a wall recess). I have found however that there are other similar parts that are easier to get hold of (Elmos‘ E981.03 is available from mouser), so this is currently the route that I’m looking at, so I guess I may make a port of your code. For me the critical part is price – I would like to be able to make an 8 button wall switch and temperature sensor for <£20. My target break down as £11 for electronics components, £2 for PCB and £5 for enclosure (3d printed front panel and buttons), £1 for assorted mechanical bits and pieces. However, I'm just getting started at the moment, so this is all a little far away. for another project we were also looking at this pricing, but found that it’s almost impossible especially if you like to create a great looking and feeling enclosure with high quality materials (like aluminium) and also need some parts manufactured directly to the PCB (which you probably need if you like to have such a miniaturized solution). Thanks for the hint to the Elmos! Is it also possible to use a KNX wall switch and decode this with the Arduino and your code? I would like to (mis)use the multiple button KNX wall switch from Jung to switch on/on my Philips Hue lamps. Also increase and decrease light intesity and maybe put some pre-defined light schedules behind the buttons. Is it possbile to use fze1066 module instead of siemens tpuart. If we use fze1066, is it pin compatible with siemens module? Should we change pcb for this changing? Because i didnt find siemens tpuart. I am currently doing my final year project and this project is similar to mine. I would love to have the PCB layout for the breadboard.